On January 26th Twitter posted a message on it’s blog explaining it’s new ability to censor tweets on a per country basis. The post by Twitter can be found here. Up until know Twitter could only pull tweets on the global level. In the old system when Twitter was ordered to remove a message or an account by a certain country the information would be removed from Twitter entirely. In the case that the origin of the message is not the country that wants it removed this could lead to a situation where a oppressive government is enforcing its censorship outside it’s borders. I don’t know if this situation actually occurred. In the new system the message would only be removed in the country where the message has been found to be in violation. This definitely seems to be a lesser evil. However I fear that this will increase the amount of times this type of action is taken. In the post they give a perfectly reasonable example of laws that prohibit spreading of pro-Nazi propaganda in France and Germany. I doubt this is the main reason for this new policy. More likely Twitter wants to keep the Chinese government happy. Thus allowing it to operate without problem on this important market. Extensive use of this feature, Twitter now offers to oppressive governments, will make it for more difficult for opposition in those countries to get their message across. It has the potential to cripple movements like the “Arab Spring”. At first sight there is nothing we can do about this practice as they are following the law in all involved countries. I however want to propose new legislation that I would hope to have Twitter reconsider. In the case a foreign government has messages from one of its inhabitants pulled I don’t see how we can intervene. However in the case of twitter removing posts of residents of Western countries criticizing China for example we must react. It cannot be allowed that a Western company takes away our right of free speech on the global Internet, even on just a part of it. When this case occurs, Twitter should be fined by our courts. I this article I responded solely to the Twitter post. I however believe that other online services have or will use a similar system if nothing is done. Maybe the others don’t communicate as openly about these policies then Twitter. A follow up is available! A video portraying a humorous action against union protest has been taken down from on-line video sharing site Youtube. This video was made on December 23th of last year, the day after a national strike of railroad personnel. To be able to make this announcement no security features had to be circumvented at all. 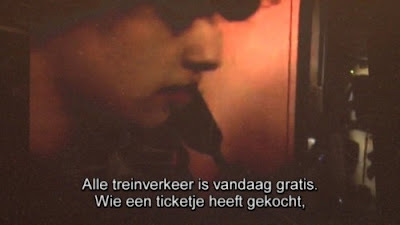 As the video clearly shows there is no lock-picking necessary to access the intercom system on-board Belgian trains. All that is needed is a generic key that can be bought in any hardware store. This same key for example is also commonly used to open fuse boxes. The link to original video is redirected to a short note on Youtube. The author of this video made a little presentation on the how and why at the 28C3 conference on technology, society and utopia in Berlin. The video of this presentation is still available online. It has the complete original video embedded. For me this is a clear example of unlawful censorship. At this time it is not know to me who took the initiative to take down this video. But I would like to invite you all to find the reason for the take down in Youtube’s community guidelines. I think it is clear that we are currently living in a society in which it is to easy for company’s and governments to censor an individual criticism. Yesterday evening in the buildings of Flanders DC in Leuven a group of intrepid idealist founded the Belgian chapter of the Open Knowledge foundation (OKFN). I was honoured to be one of them. The goals of the organization will be to promote the release, use and enrichment of open data, information and knowledge in Belgium. OKFN Belgium is an NPO according to Belgian law which has it official address in Ghent. The first board consists of Pieter Colpaert (@pietercolpaert), Lieven Janssen (@lievenjanssen), Katleen Janssen (@katleenjanssen), Stef Roelandt (@stefroelandt) and Wouter Vanden Hove (@woutvandenhove). For more information about OKFN Belgium see the website http://okfn.be or follow the foundation on twitter @okfnbe.